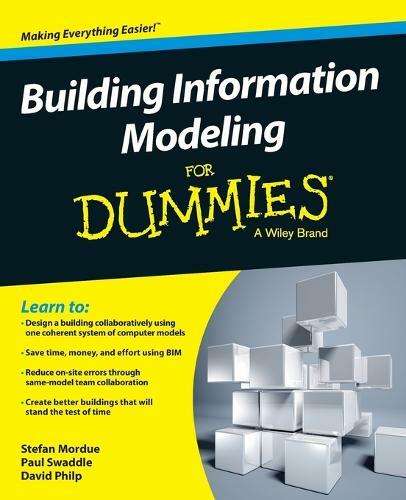 Everything you need to make the most of building information modeling If you're looking to get involved in the world of BIM, but don't quite know where to start, Building Information Modeling For Dummies is your one-stop guide to collaborative building using one coherent system of computer models rather than as separate sets of drawings. Inside, you'll find an easy-to-follow introduction to BIM and hands-on guidance for understanding drivers for change, the benefits of BIM, requirements you need to get started, and where BIM is headed. The future of BIM is bright it provides the industry with an increased understanding of predictability, improved efficiency, integration and coordination, less waste, and better value and quality. Additionally, the use of BIM goes beyond the planning and design phase of the project, extending throughout the building life cycle and supporting processes, including cost management, construction management, project management, and facility operation. Now heavily adopted in the U.S., Hong Kong, India, Singapore, France, Canada, and countless other countries, BIM is set to become a mandatory practice in building work in the UK, and this friendly guide gives you everything you need to make sense of it fast. * Demonstrates how BIM saves time and waste on site * Shows you how the information generated from BIM leads to fewer errors on site * Explains how BIM is based on data sets that describe objects virtually, mimicking the way they'll be handled physically in the real world * Helps you grasp how the integration of BIM allows every stage of the life cycle to work together without data or process conflict Written by a team of well-known experts, this friendly, hands-on guide gets you up and running with BIM fast.